If you’re lucky enough to have more than one reception room then you have a bit more freedom when deciding what to do with your secondary space. Families with children or just young-at-heart adults could opt for a family room or games room; whether it’s a pool or snooker table room, a comfy relaxation or TV area, a video games haven, a playroom packed with toys or a sports room with accompanying bar. Usually games rooms are naturally fun, recreational spaces so it’s important that the furnishings are functional but enjoyable with an emphasis on comfort, storage, games and entertainment. If you have the scope, family room extensions are a great way of extending from your kitchen or other area of your house to create a whole new, dedicated family space or games room. Basements are also wonderfully suited to house games rooms as they are usually soundproof and secluded so that loud games, films and cheers of success or failure won’t be heard next door or upstairs. If you do have, or plan on having, a separate games room, it’s a great opportunity to go to town on the games, entertainment, gadgets and laid back feel you can have in this informal living space. Look through the hundreds of family room ideas and games room ideas on Houzz to help inspire your own project. What furniture does my family room or games room need? This should be a relaxing place that promotes fun and socialisation, so fill the room with comfortable seating. Plush armchairs, wide sofas, bean bags and reclining chairs are all great games room ideas that promote R&R. 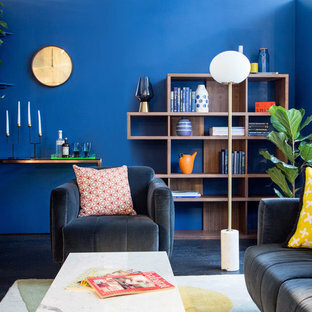 Add coffee tables and side tables for holding glasses and plates (if they’re allowed), books, magazines and all the other knick-knacks that accumulate in a family room. TV stands or media units are great for keeping DVDs, audio systems, gaming consoles and all other gadgetry neat and organised. If you have small children, be mindful of free floor space for any rough-and-tumble and bump-able surfaces. A cosy rug will be a great addition but make sure it doesn’t easily slip under fast moving feet! If you’re going all out for the games room option then the sky’s your limit when it comes to games tables and other gaming equipment. Snooker, billiards and pool tables will keep competitive spirits busy but if you don’t have the room, table football could be a more suitable option. There’s also air hockey, poker tables, table tennis and cribbage tables; simply pick your game of choice. 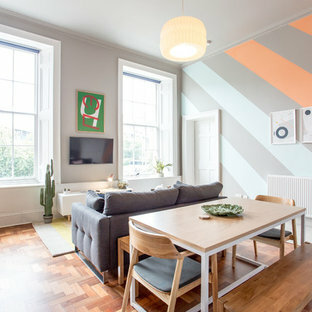 And of course, if you’re a big fan of the arrows a dart board will be a necessity, just make sure you have a safe area to practise in and your walls are well protected! What family and games room decor should I use? Photographs, artwork, colour schemes and textures that reflect the essence of your household will add charm and promote a sense of comfort and relaxation for your family. Fill the room with features your family love – films, board games, books, music and perhaps sports memorabilia. Keep decor functional and practical – pristine white upholstery and rugs are probably not the ticket for the hustle and bustle of a games or family room. If you love light or neutral tones family room ideas that could work include light leather sofas, which will be easy to clean in the case of any spills, and soft coloured cushions and throws that can be thrown in the washing machine whenever necessary. If you see your games room as a serious and competitive arena, set the mood with dark and grown up colours such as inky blues and deep greens, as well as lots of mood lighting. If you want the fun and games to stay lighthearted then you can keep your games room bright, colourful and punchy. How do I create a family or games room space in a small house? If you don’t have more than one reception room then it may seem out of reach to think about a games or family room design. However, if you have a large kitchen, consider an open plan kitchen family room – just adding a sofa or some comfy chairs and a space to read, watch TV or simply sip your coffee in the morning, will turn your kitchen into a cosy, relaxing family room that’s, most importantly, within easy reach of the fridge and food cupboards. Without a large kitchen or second reception room then it will be up to your living room to provide you with your games room or family space, and this is where storage will be your new best friend. Clever games room ideas such as hidden drawers in sofas; coffee tables and benches that store games, toys and DVDs; and clever media centres that hide away your TV, DVD players, consoles and Hi-Fi systems; can help make the room become more formal on separate occasions. 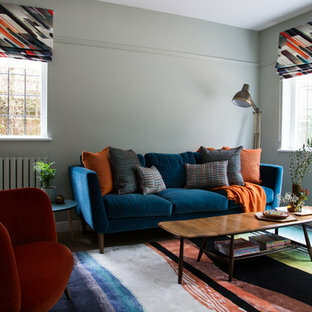 Take a look through the photos on Houzz to get some great games room and family room ideas and inspiration. You may find the family or games room design you’ve been looking for and you can contact the professional that designed it to see if they can create something similar for you. Design ideas for a contemporary open plan family and games room in Orange County with white walls, a standard fireplace, a stone fireplace surround and a wall mounted tv. 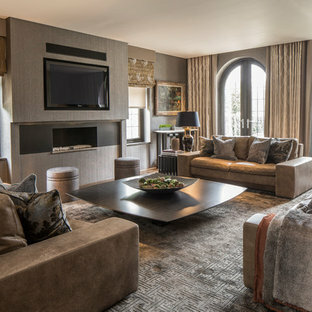 This is an example of a contemporary family and games room in London with grey walls, dark hardwood flooring, a ribbon fireplace and a wall mounted tv. Photo of a medium sized contemporary enclosed family and games room in London with blue walls, dark hardwood flooring and black floors. Photo of an urban open plan family and games room in Manchester with red walls, medium hardwood flooring, a freestanding tv and brown floors. 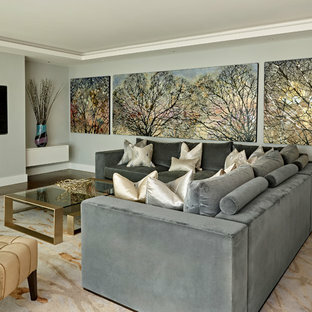 This is an example of a contemporary enclosed family and games room in London with beige walls and a wall mounted tv. 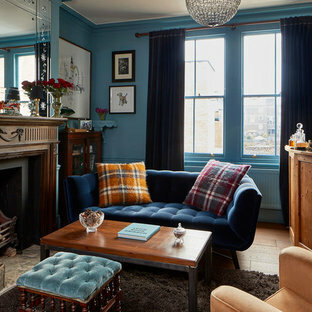 Inspiration for an eclectic enclosed family and games room in London with a home bar, blue walls, medium hardwood flooring, a standard fireplace, a metal fireplace surround and brown floors. Photo of a classic family and games room in Kent. This snug/ family room completes the open plan kitchen/living/dining space. Walls which previously separated the utility room were removed to open up the space to be re-designed as a snug. The bespoke wall panelling, designed to echo the cabinetry in the kitchen, is grand but subtle in-keeping with the essence of the property. The wood burner finishes the room - making it a cosy, welcoming space for Grace and Henry to enjoy with their young son. Design ideas for a large contemporary family and games room in London with white walls. Photo of a classic family and games room in London with a reading nook and light hardwood flooring. 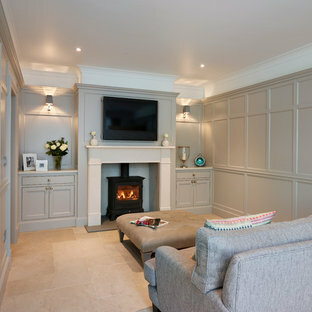 Inspiration for a traditional open plan family and games room in Surrey with a game room, beige walls and grey floors. Inspiration for a medium sized contemporary enclosed family and games room in London with a ribbon fireplace and a concealed tv. Design ideas for a classic mezzanine family and games room in London with a built-in media unit and light hardwood flooring.